Merritt, 2012 Olympic hurdles champion and world record holder, has withdrawn from this Saturday’s New Balance Indoor Grand Prix at Boston’s Reggie Lewis Center. The news was released by meet organizers late this afternoon. Merritt was one of the first athletes to commit to the 18th NBIGP, and is a big loss. 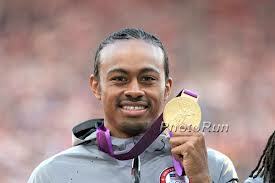 He’d run the meet twice before, taking seventh in the 60m hurdles in 2010, then second last year. That still leaves Olympic champions Tirunesh Dibaba (10,000m) and Jenn Suhr (pole vault) as meet headliners, along with Olympic silver medalists Galen Rupp (10,000m) and Dejen Gebremeskel (5000m) who will meet in the 3000m on Saturday. Dibaba opens her season on the way to a highly anticipated debut marathon in London in April. She’s broken the 5000m indoor record twice in Boston (2005 & 2007). YES, BUT IS IT A REAL TOUR?